November Issue 128 - On Sale Now! 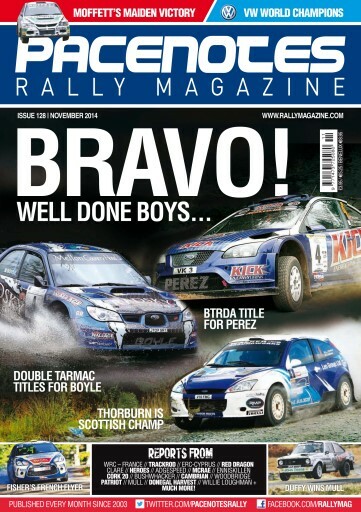 Our front cover has three fantastic champions featured… Declan Boyle on completing the double - Irish International and National Tarmac Titles, Steve Perez on winning the BTRDA Series and Euan Thorburn's Scottish title success…. full reports inside. We have the usual news round up, as well as WRC report from France which includes British ace Ali Fisher on his category victory. 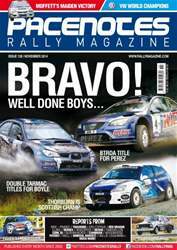 Martin Holmes has his usual round up and Retro piece on Spanish rallying to look forward to. We cover a mammoth selection of rallies and reports this month ranging from the Trackrod, ERC Cyprus, Red Dragon, Clare, McRae, Cork 20, Bushwhacker, Cambrian, Mull, Willie Loughman and Donegal Harvest. Clubman events are well catered for too, with the likes of Adgespeed, Heroes, Woodbridge and Patriot in this month’s edition. Club of the month features Five Counties MC aka 'The Brady Bunch', while we have a look at Clubmen Martin Cairns and James Williams as well. We have loads more inside this months action packed Pacenotes issue, but if you want to know more, you will have to visit the newsagent or download this latest edition to your iPad or iPhone. It is also available for Android too.